One bedroom with a balcony: a double or twin beds with no view. 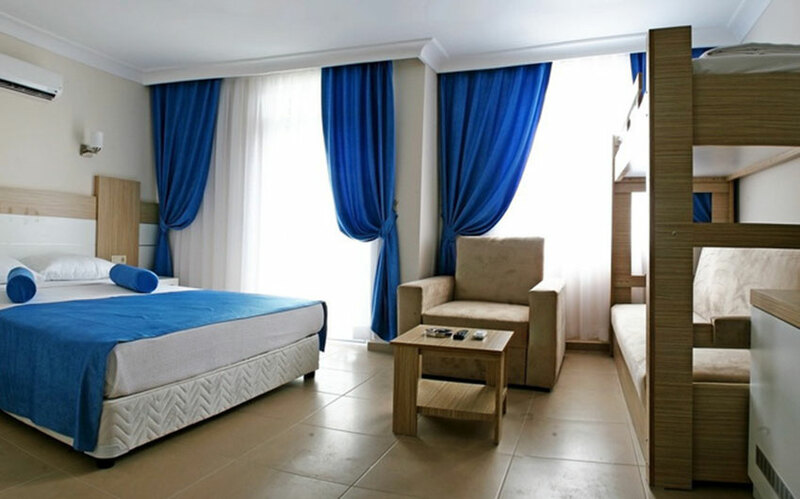 Room with 1 double bed and 1 single bed and large balcony. Extra baby cot can be added. Board Basis: All inclusive Food and Drinks. 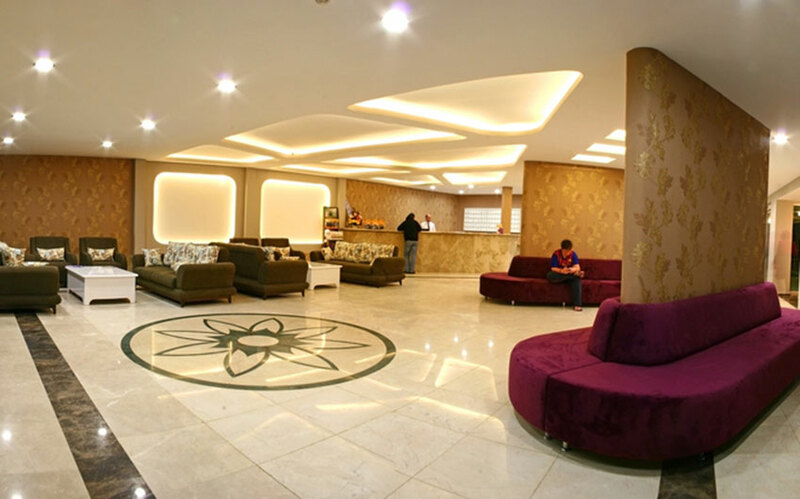 Grand Akca Resort Hotel is a remarkable selection to embrace and fulfill your Islamic vacation requirements. 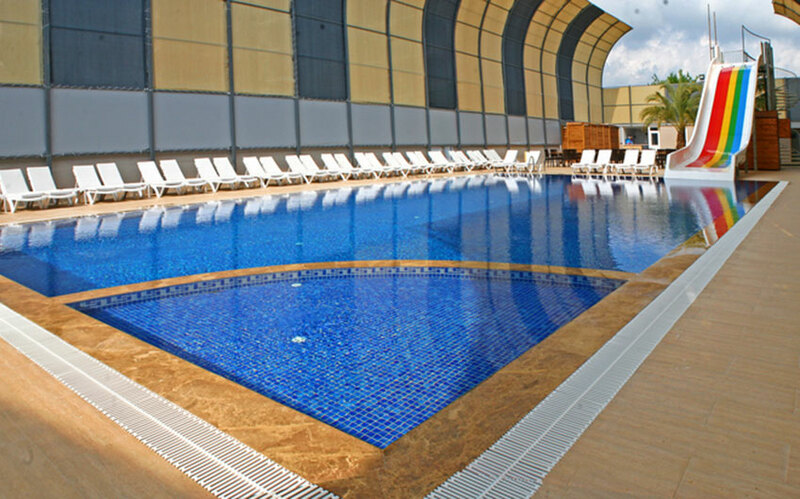 Grand Akca Resort Hotel is a serene beach resort, presenting an extraordinary array of facilities. It is situated in quiet a rural area of Gazipasa, with easy access available to the Blue Flag private beach nestling turtle spawning zone. 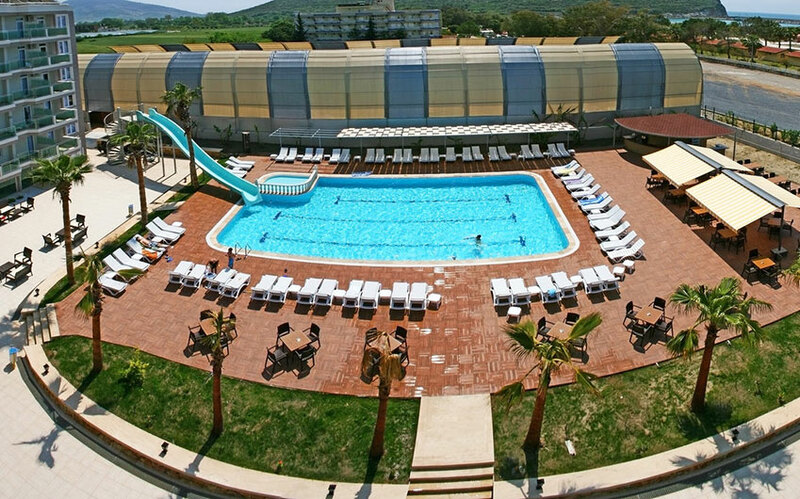 Keeping in line with the “Muslim Holiday” impression, Grand Akca Resort Hotel in Gazipasa is a very cordial and pleasant destination to let you admire and appreciate an extraordinary vacation experience. 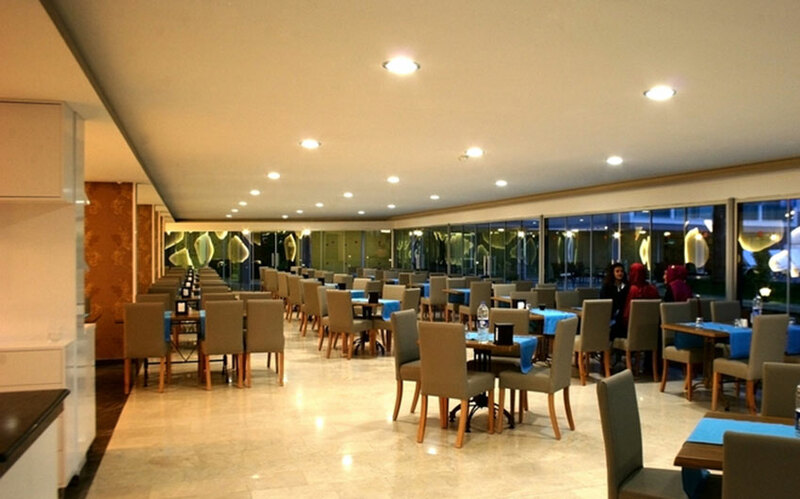 Unlimited open buffet Breakfast (08:00 am – 10:30 am), Lunch (12:30 pm – 02:00 pm), Dinner (07:00 pm – 09:00 pm), snacks between meals. Akdeniz private mixed beach for families (modest swimming dress code imposed). 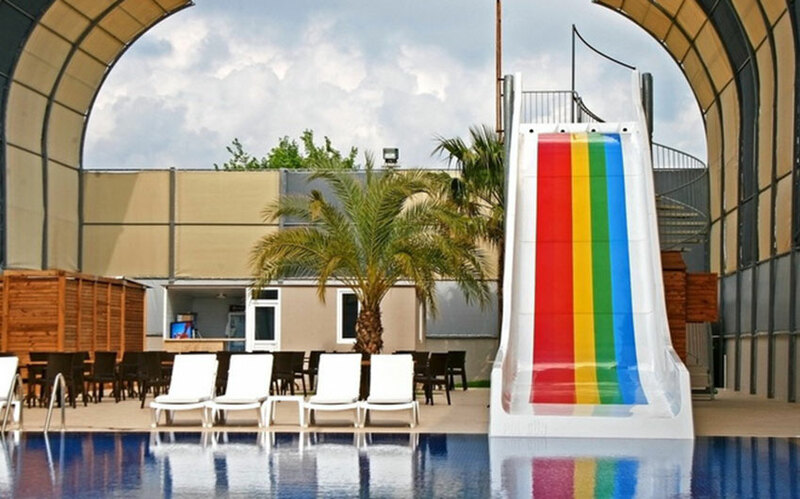 1 women only outdoor pool, 1 men only outdoor pool, kid’s pool and water slide in both. Table tennis, water sports, rafting. Summer season daytime entertainment and evening activities includes games, live folk music, shows, comedy plays, poetry, etc. 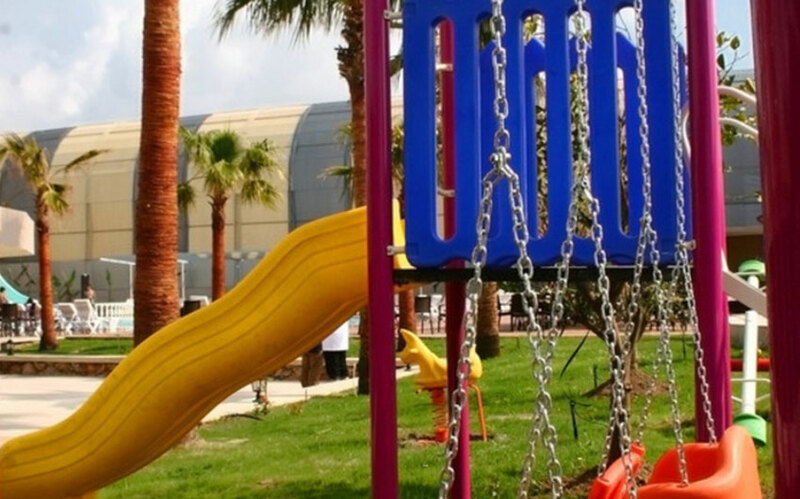 Kids’ pools, kids’ playground, games room, entertainment staff. 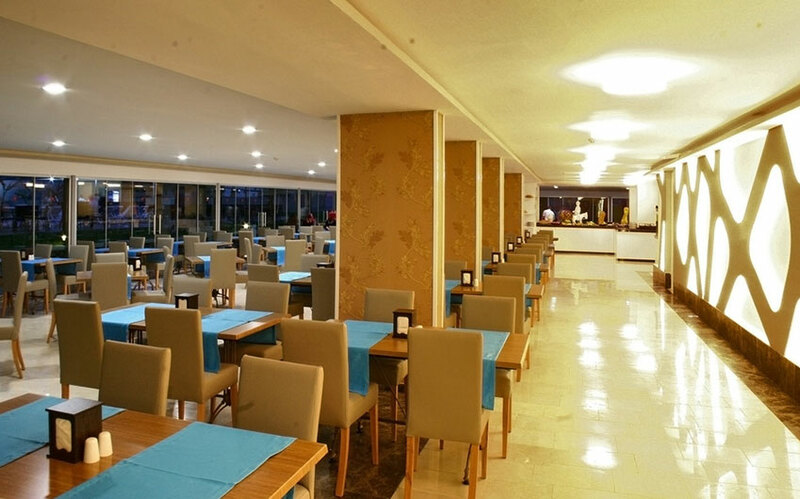 The restaurants and cafes situated in the resort serve a wide selection of Turkish and International cuisine provided with breakfast, lunch and dinner served as an open buffet. Light snacks are also served at certain times between the meals (usually in the evening time). NOTE: All food within the hotel premises is halal. Alcohol is not served or allowed on hotel’s premises. Antalya is a flawless blend of sun, deep turquoise waters and the mountains obscured with trees – a fusion that is rare to be seen anywhere else. One of the most captivating ingredients of the city are its superb palm trees that are a welcoming indication of the Mediterranean climate, mildly cooling off any fatigue that the vacationer might come with. With its ever-expanding tourism and hypnotic nature, Antalya embraces the visitors for an extraordinary holiday experience. 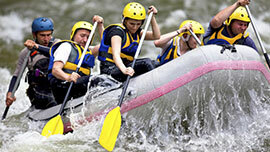 An exciting and thrilling 14 km rafting tour in Köprülü Canyon is a really popular rafting circuit in Antalya. Experience this adventure with your friends by hiring a professional guide to make the most out of it. This 4-hour bike ride would make the city tour effortless and yet very exciting. Traverse freely across the city’s cliff top parks, old quarter and historic monuments. Appreciate the mighty Lower Düden Waterfalls; capture images of second century Hadrian’s Gate; and cruise the amusing lanes and marina of Kaleiçi to explore its wooden town houses, bazaars, bathhouses and landmarks. Don't miss out on the breathtaking experience of the cable car ride to relish astonishing sights from the Peak of Tahtali Mountain that stands 2365 meters above sea level. You would witness the stunning shoreline of Antalya region, magnificent mountains, deep blue Mediterranean Sea and pine forests. 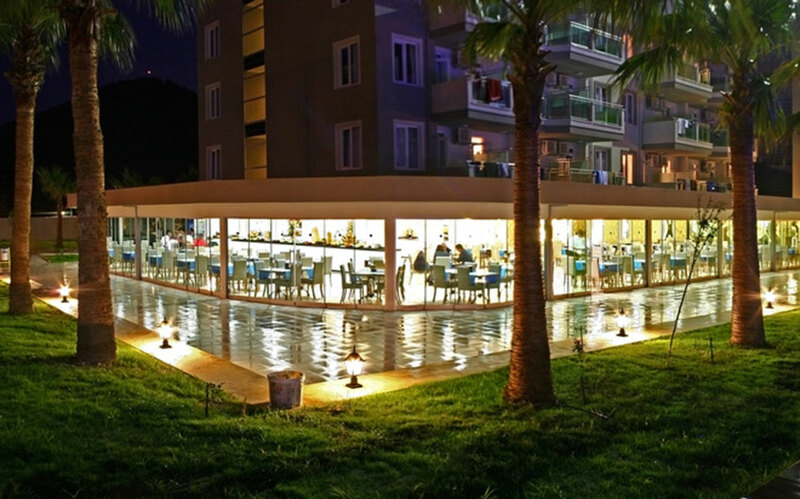 Antalya is one of the top places where you can relish the genuine flavors of Turkish cuisine. It is greatly suggested that you try especially the bitter orange marmalade, which is made with a regional recipe and you would never forget the tang of this delectable marmalade. Restore your energies at the Termessos spas that would reveal to you the secrets of rejuvenation and relaxation on a different level. 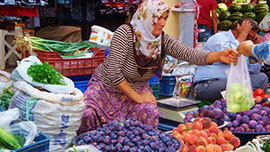 It is entirely up to you to pick from an array of things to do in Antalya. You will definitely have a time worth remembering and leave you with pleasing memories. 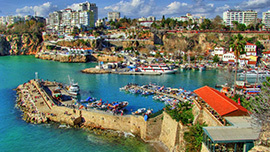 Antalya used to be just the doorway to the Turkish Riviera, but in present it has turned out to be one of the most desired spot of vacation in itself. 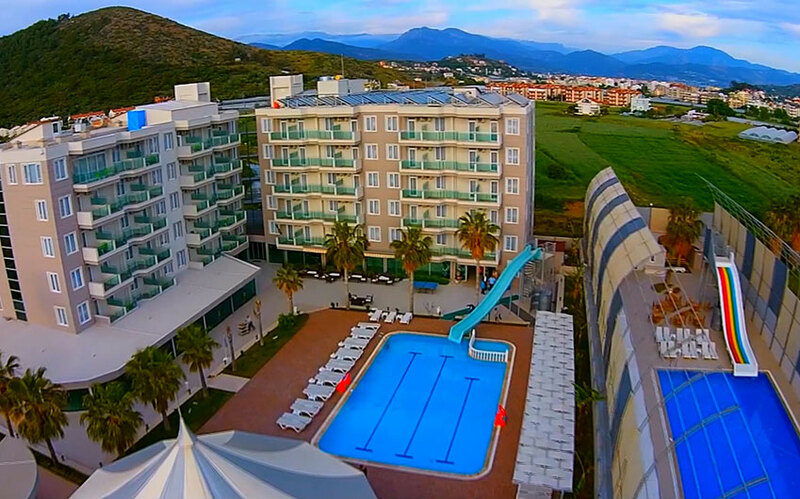 Largest city of Turkey, located on the western Mediterranean coastline is not only remarkable in its natural beauty but also fashionably contemporary. At the very heart of Antalya is the superbly conserved ancient city district of Kaleiçi that proposes a distinctive accommodation ambiance copious with an accumulation of finely renovated Ottoman houses. The historic city cloaks around a glorious Roman-era wharf with hilltop sights of misty blue mountain contours. Antalya has an account that goes back to 133 BC. The relics of the city's pre Roman and Roman past are scattered throughout the city and indifferently engrossed into its modern-day texture. 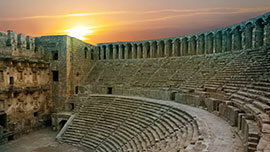 Move out of the city’s boundary and you will discover the historic sites of Perge, Aspendos and Termessos. The debris of few of the Turkey’s once-leading civilizations could be scaled and explored there – something to be experienced by an inquisitive mind. Few of the many worth seeing historic sites in Antalya are the Antalya Museum; the ethnography Museum Suna & İnan Kıraç Kaleiçi; Sultan Alaadin Camii – the gem of a mosque; Yivli Minare – the minaret erected in 13th century by Seljuk Sultan Aladdin Keykubad; Ataturk Statue and Antalya Kültür Evi – finely refurbished Ottoman mansion reflecting the architectural history of the city.